B&M 4th Dimension Coasters; Coming Soon? There has been lots of speculation around what SFMM has in store for 2013, an the appearance of coloured steel beams backstage has only fuelled those rumours. Although may think that the beams are for a slingshot upcharge attraction, that leaves us wondering, “What about Full Throttle?” Since the name and features were supposedly leaked at WCB, we have heard countless rumours about length, speed, inversions, but if all of these are true, Six Flags Magic Mountain may have another winner on their hands! 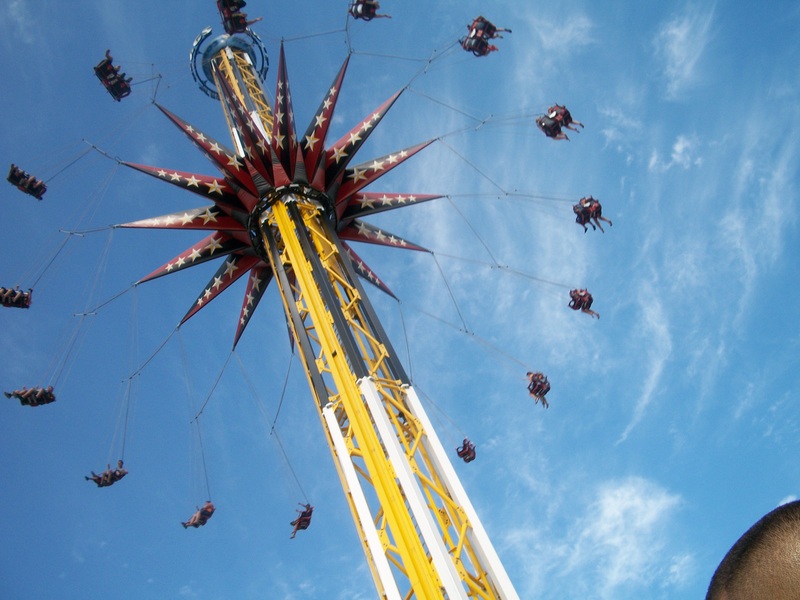 One piece of news that is making the rounds, is that Six Flags New England was recently granted an exception to the normal height limit, allowing them to build a rumoured 400ft tower swing ride, similar to the other Sky Screamers at other Six Flag parks. Since the announced removal of Flashback and Texas Chute Out, we’ve heard many rumours of what may take up this plot of land next season, but one rumour that has gained traction is the introduction of a similar tower swing ride to what is planned for Six Flags New England. The park recently released this image via their Facebook page, proving that we will see something new at the park, but the scale of it, we don’t know. Great America could simply be getting 6 new shows like SFOG did this season. Now, this one is pure RUMOUR, because absolutely nothing about this one has been confirmed. But people are saying, (Screamscape) that the park’s shoot the chutes Tidal Wave, will removed soon to make room for something new, possibly a relocated Flashback from SFOT. Remember, these are all just rumours, we’ll have to wait for the big Six Flags announcement to learn what the chain REALLY has in store for what is looking like a very exciting 2013. As the major announcement dates for 2013 coasters come nearer, I’m starting to see something unfortunate happen at many parks, COASTER REMOVAL. Now, I know the world we’re in, the old must make room for the new. 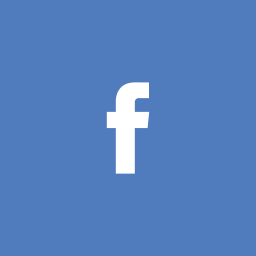 Here are a few current, newsworthy examples. It has been long known, and disliked that Cedar Point was planning to remove Disaster Transport and the Space Spiral observation tower rides to make room for the park`s 2013 coaster Gatekeeper, but sadly those plans have come through as both rides have seen their last days of operation. Yes I know, this has been commented on before here on PureCoaster, (read my other post here.) In short, Son of Beast has been SBNO since 2009, and although many enthusiasts were hoping for a refurb, it is now slated for demolition. It was just announced that Six Flags Over Texas will be closing 2 attractions on September 3rd. One of these is the park`s boomerang Flashback, which will supposedly be rotated to another Six Flags park for the 2013 season. 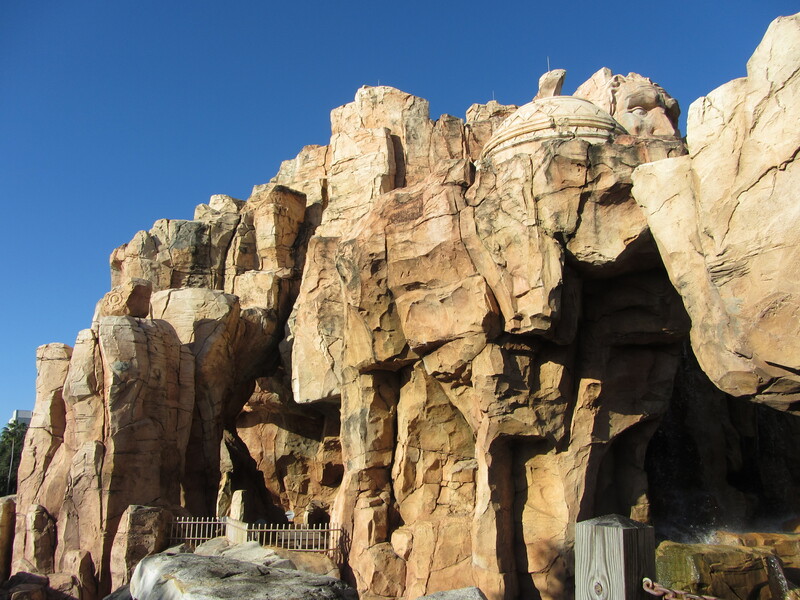 However, the news that a second ride will be closing really saddens me, as that ride is Flashback`s neighbour Texas Chute Out, certainly a classic ride and seeing that there aren`t a lot of parachute towers out there, this ride will be missed. Although nothing`s been confirmed, but rumour has it that Six Flags New England will be saying goodbye to their sky coaster Taz`s Daredevil Dive to make room for what will supposedly be the world`s tallest tower swing ride. 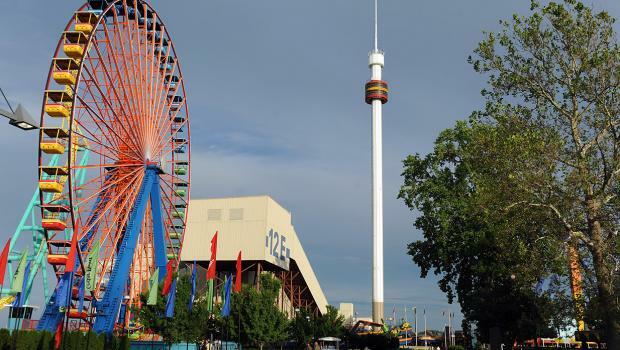 The park has been granted an exception to the current height limit to build a tower swing similar to the SkyScreamers at other Six Flags parks, except the proposed height would be 400ft tall. Despite the removals, I’m really excited to see what the amusement industry has to show us for next season. 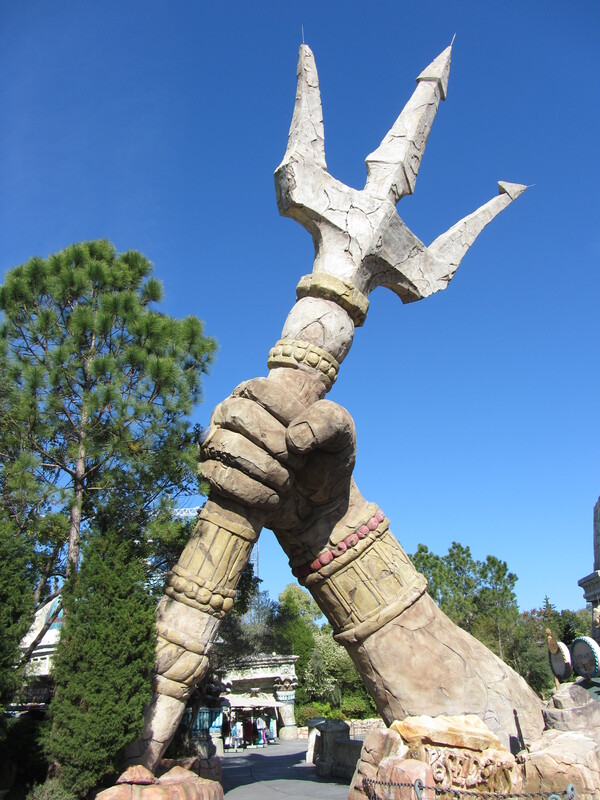 Keep checking PureCoaster for news on 2013 coasters! One odd lift system I’ve encountered in my trips to theme parks is the spiral lift found on Zamperla’s Volare flying coaster. Instead of a linear chain lift, a central rotating structure makes contact with your car and pushes you up the spiral track. 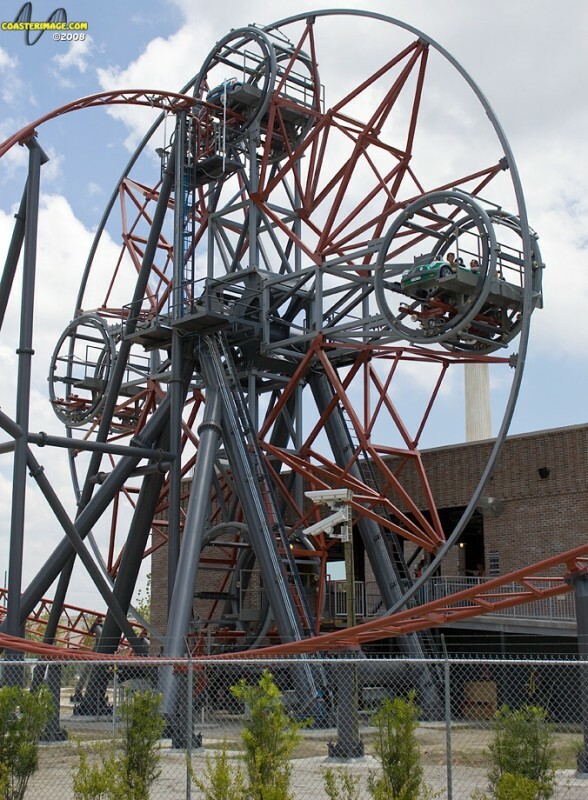 This lift hill, found at the shuttered Hard Rock Park/Freestyle Music Park, features a one-of-a-kind “ferris wheel lift.” Trains exit the station and enter their own little section of the wheel, then it rotates so you move around the centre and end up at the top. 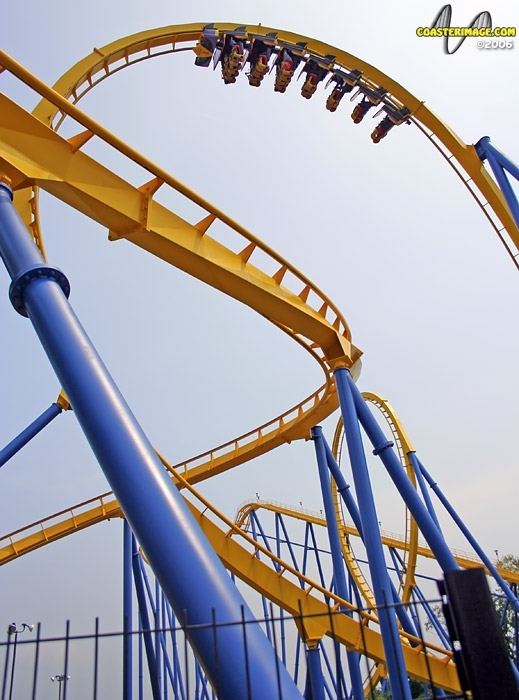 Once at the top, you are pushed forward out onto the running course of the coaster. I don’t think it gets any weirder than inverting ON the lift. On the Maurer Sohne created G-Force at Drayton Manor, riders are puled up the first half at the loop, and once at the top, you are set free from the lift and you finish the loop and go through the rest of the coaster’s twisted layout. Which lift hill do you like? The first, and by far the most obvious one is the Rocky Mountain Coasters project at Silver Dollar City. 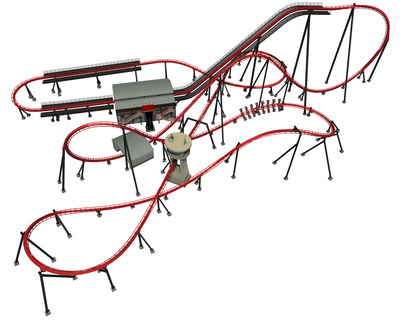 The rumoured name for this coaster is the Outlaw, as hinted to in the attraction’s teaser site: http://silverdollarcity2013.com/ From what we can see so far, this ride looks like the New Texas Giant’s successor, with a super steep drop, intense banking, and the one thing that’s got everybody talking: the zero-g roll. What was originally looking like an extreme over-banked curve, is now looking like the first inversion on a wooden roller coaster since Son of Beast’s loop! Plus, this particular inversion continues after inverting, because it has a pullout in the same rolling fashion! I don’t know why the park doesn’t just announce the ride officially, because the gargantuan lift structure is visible from the nearby steam train. But, on the upside, it gives us websites easy access to construction photos! 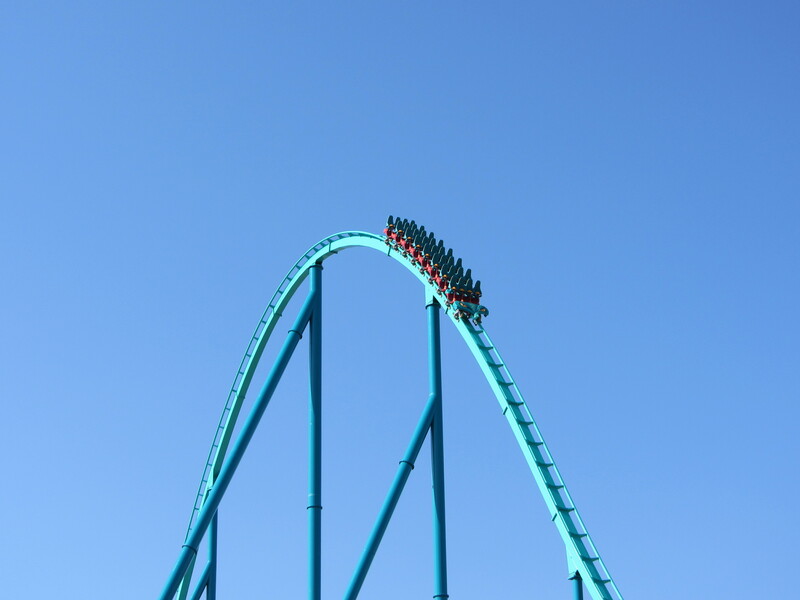 This coaster is definitely one to watch! On a lesser note, when Cedar Fair opted out of selling California’s Great America, they promised, and we all knew that they would be adding new rides and roller coasters to replace the ones that were removed in the past decade. 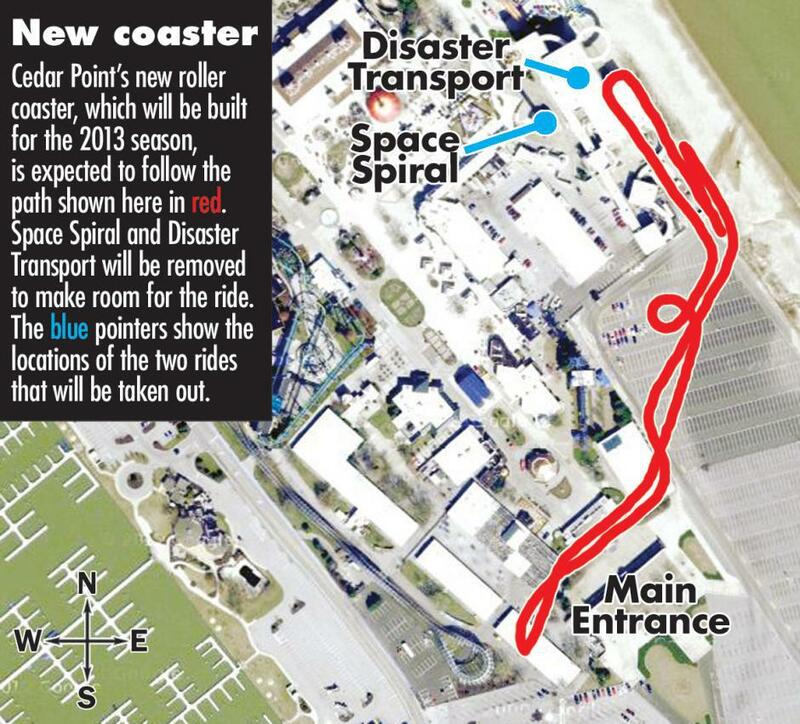 So, for the 2013 season, it looks like they’re finally pulling the trigger on the planned GCI wooden coaster! 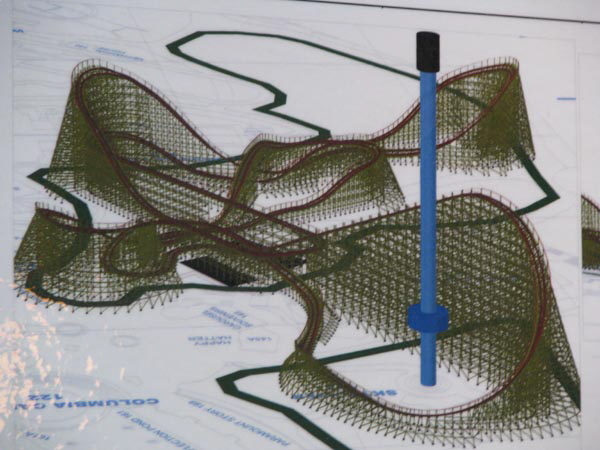 The planned coaster would be located at the park’s entrance, and wrap around the Star Tower observation ride. 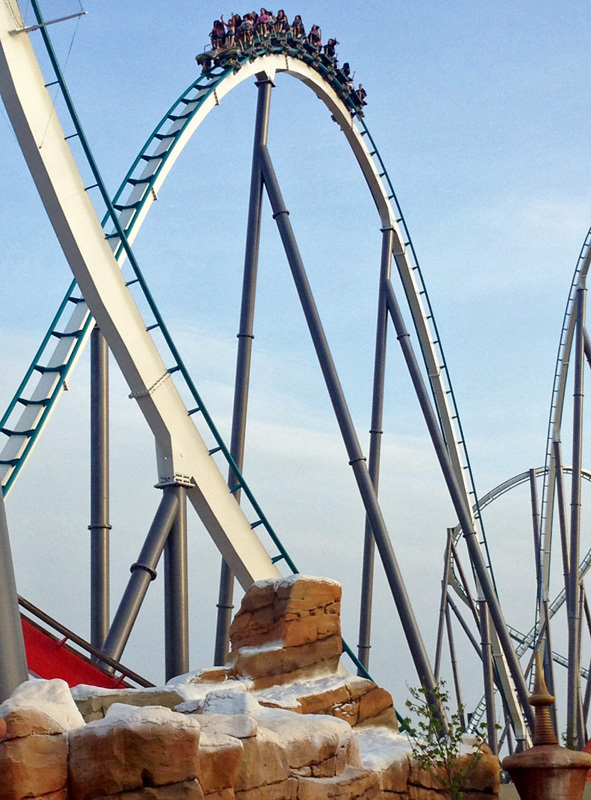 The layout sort of reminds me of the recent Wodan at Europa Park. We’ve already seen land clearing for this ride, plus some rather obvious signs, so we can pretty much guarantee seeing this ride open next year! Finally, Six Flags recently announce that the Rattler at Six Flags Fiesta Texas will be closing on August 5. Is this leading to a Iron Horse treatment to turn this ageing woody into the Rattler: Reborn? Hopefully this will reopen with a new track profile next year because the New Teas Giant transformation looks fantastic, and I can’t wait to see what RMC might have in store for the Rattler, especially with it’s unique terrain. 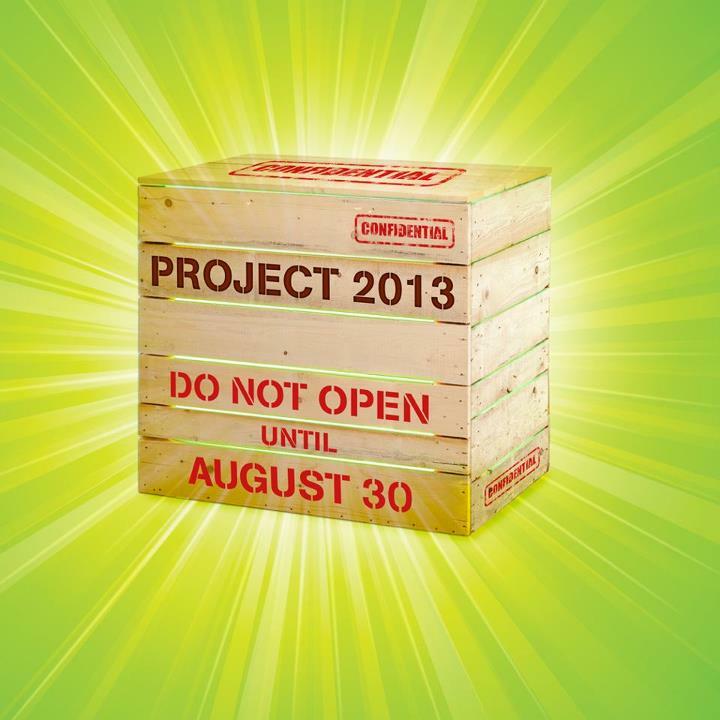 That’s all we know about wooden coasters for next year, so far. So far, which project sounds the most intriguing? Quite recently, Universal has demolished the vacant Soundstage 44. 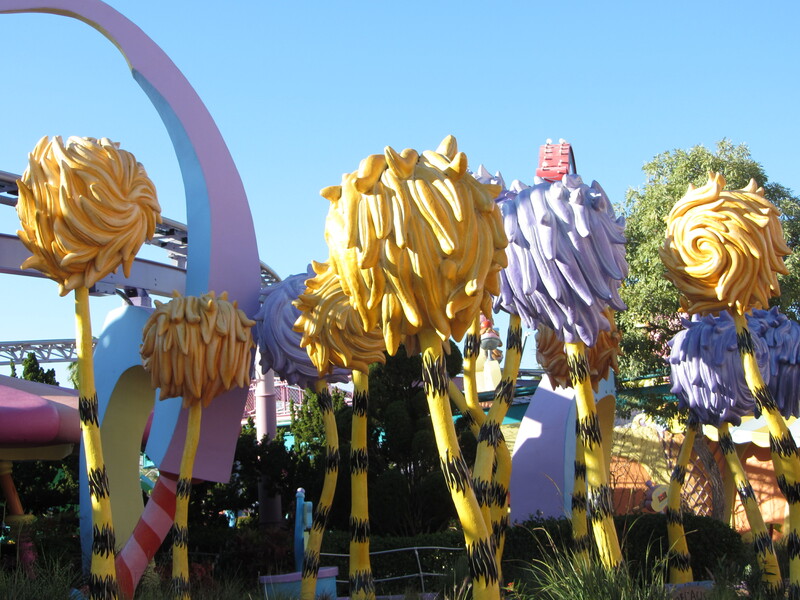 Due to the rapid demolition, and the recent openings of the famed Transformers rides in Hollywood and Singapore, many think we will see another incarnation of the Transformers ride be built at Universal Studios Florida. Based on aerial imaging, the show building for Transformers would fit, however they would need to dig deeper before putting in the foundation due to the three levels in the current ride. Remember when Universal announced that they would be greatly expanding the current Wizarding World? Well, that expansion may be coming in the form of a Diagon Alley/London area taking the place of Jaws. Many blueprints and permits have been leaked that suggest this will happen. An additional note on this project is that we may see a Hogwarts Express link the two parks, as one station would be in Hogsmeade at IOA, and another would be in “London” at USF. We’ll just have to wait to see what will become of the Jaws wasteland. Out of all of these projects, the only one we can confirm for sure is Universal Orlando Resort’s newest resort hotel; Cabana Bay Beach Resort. 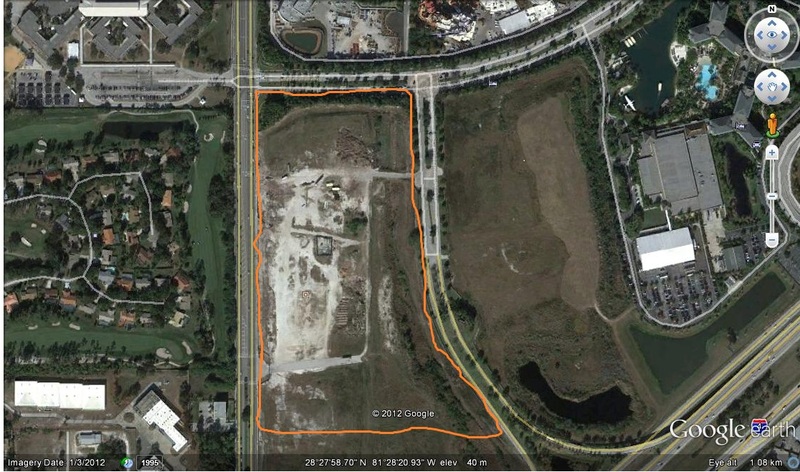 This will be UOR’s fourth resort hotel, and it has a planned opening date of sometime in 2014. ….will evoke the driving vacations so many Americans grew up enjoying with their families – spending time at sweeping motor courts just off the highway, where families relaxed and played after a long day’s drive. 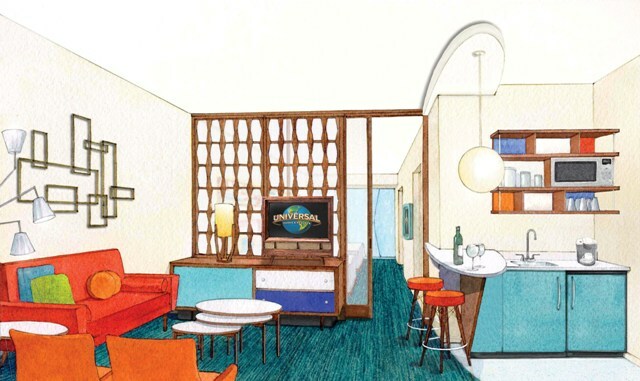 The new hotel’s hip, vintage look will be accented with bold design, dramatic, clean lines, bright, period colors and touches of neon. The resort will feature 1800 rooms; 900 standard rooms, and curiously, 900 family suites. Based on the fact that they say this resort will feature “900 family suites” I think that this is meant to be a direct competitor to Walt Disney World’s Art of Animation Resort. It should be noted that this will presumably be the cheapest hotel on property for Universal, especially if they intend to compete head-to-head with Disney’s value class of hotels. All three of these projects seem interesting to me, and I’m really excited to continue to watch these projects grow and develop. Disney’s got some tough competition! 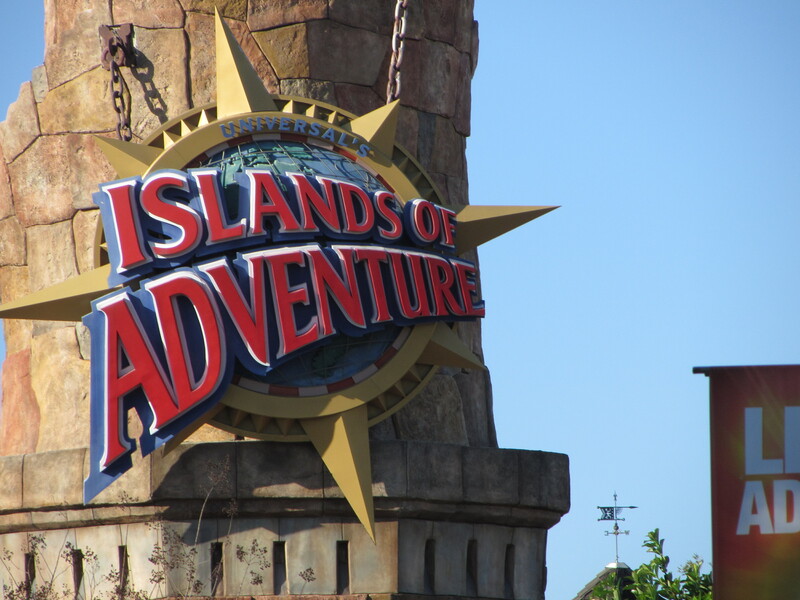 Back in 2007, Universal announced that they would be building a the first new “island” at Islands of Adventure. 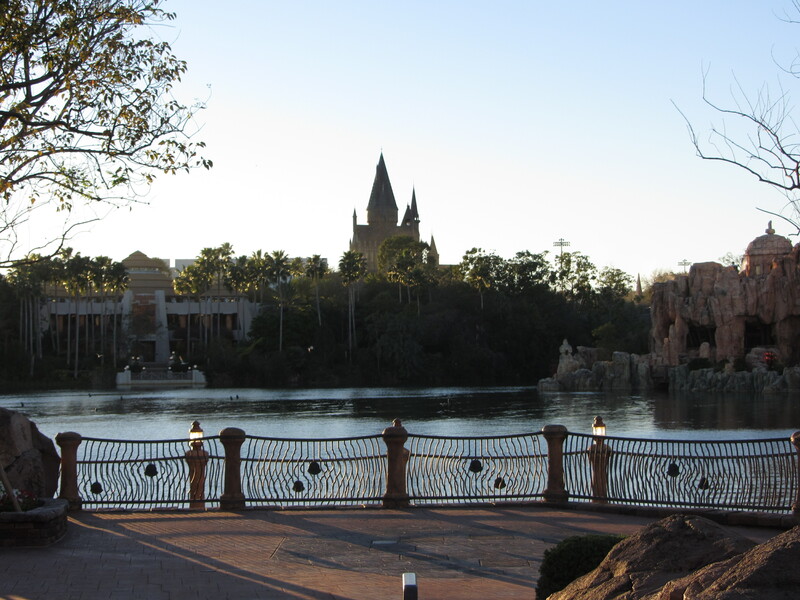 That island came in the form of the Wizarding World of Harry Potter. Now Universal took this very seriously, and they worked tirelessly to make this accurately themed, even going so far as to collaborate with the book series author J.K. Rowling. 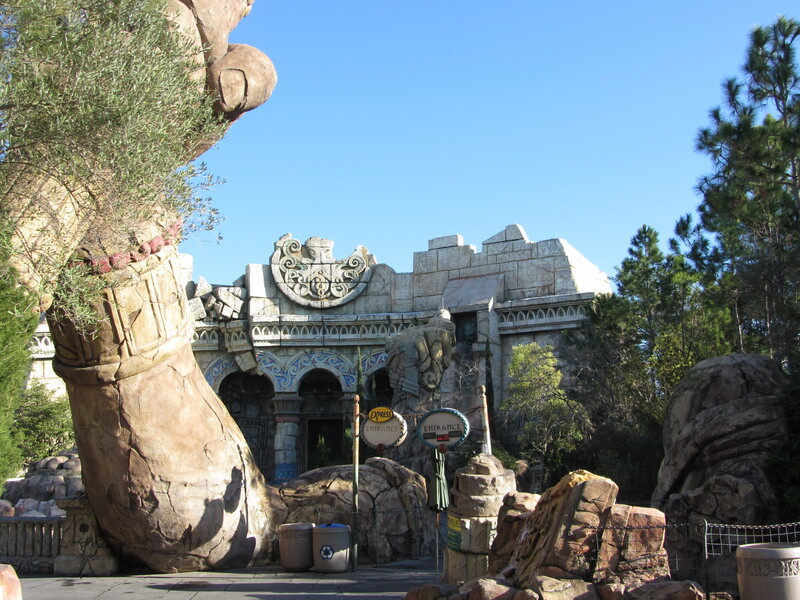 The end result, is by far the new gold standard for theme park lands and attractions. 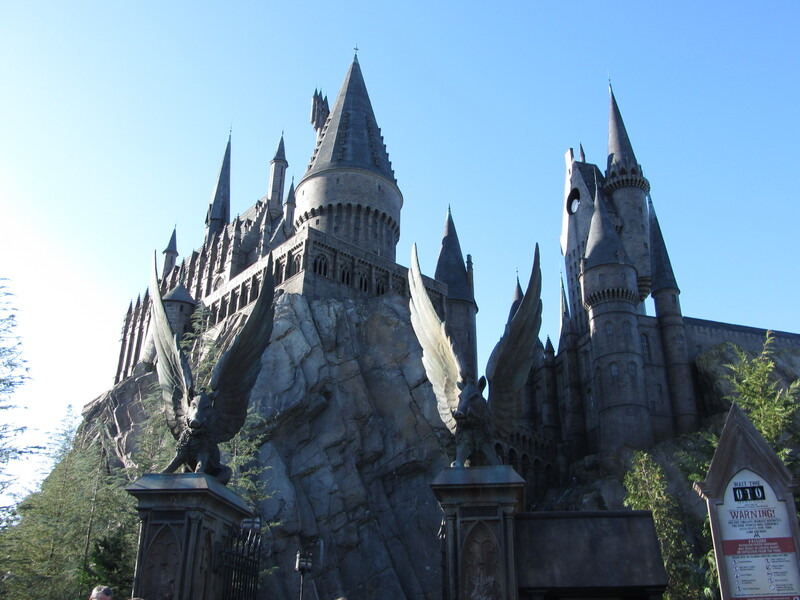 In fact, the land’s biggest attraction Harry Potter and the Forbidden Journey is often regarded as the world’s best dark ride, surpassing IOA’s own Amazing Adventures of Spiderman. Now, in a surprising twist, Universal has announced the creation of two more Wizarding Worlds at Universal Studios Hollywood Universal Studios Japan. Both will feature the same high levels of immersion as the one in Orlando, and the famous Harry Potter and the Forbidden Journey attraction. The Japan version will be the first to open, because no attractions need to be removed like in Hollywood due to space constraints. Another point I find interesting is that not only does Universal plan on building these two new Wizarding Worlds, but greatly expanding the current one in Orlando. Rumours point towards this expansion actually linking Universal’s 2 Orlando parks via a Hogwarts Express train attraction that would go backstage from the existing Wizarding World to the supposedly planned Diagon Alley section replacing Jaws in the Studio park. Is Universal going TOO far with Harry Potter? Now, I understand that it produces massive cash for them, but if it’s in every single Universal park, then it won’t be special. Like Jurassic Park or Revenge of the Mummy, they are just cookie cutter rides placed in each park, even the brand new park in Singapore! If Universal continues at this rate, we may see the Wizarding World being built into new parks like the ones planned in South Korea, and Russia. Personally, as long as there is some differences between each Wiz. World, I’m okay with it. Like, if the one in Hollywood ends up being the exact same as the one in Orlando, (minus the dueling roller coaster,) I’ll be pretty mad! We’ll just have to see what Universal is going to do with this amazing concept. The second interpretation of the Manta coaster concept just opened at SeaWorld San Diego, and seeing as they are so different, I think it’s just about appropriate to compare them on PureCoaster. Now, I’m going to compare them in three subtopics before the poll, just so we can learn a little about these coaster cousins. 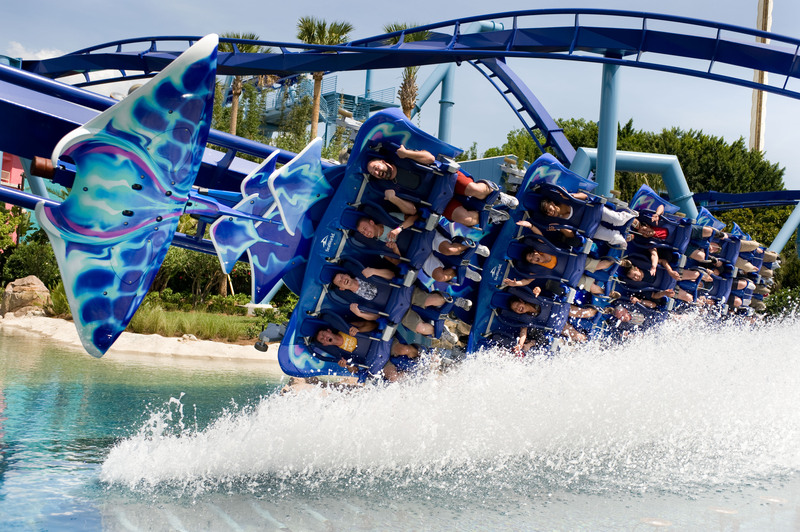 The original Manta at SeaWorld Orlando is a flying coaster by B&M, meanwhile the new Manta at SeaWorld San Diego is a MACK launch coaster. These coasters couldn’t be more different when it comes to classification, and layout. In Orlando, you see four inversions, one of which is a gargantuan pretzel loop. On the other hand, in San Diego it’s very low to the ground with lots of tight high speed curves. What is to me the most iconic thing about these coasters is the splashdown. The one in Orlando is very grand, and very showy, meanwhile the new one in San Diego is more subtle, and likewise more realistic. 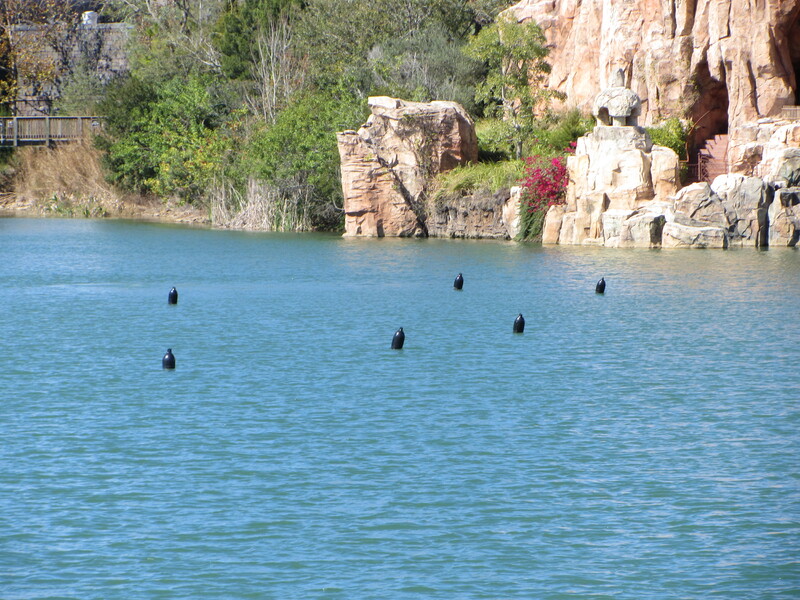 Both are very unique effects that have become a sort of trade mark for SeaWorld. Seeing as they are different makes of coaster by different manufacturers, the trains for these coasters are quite different. 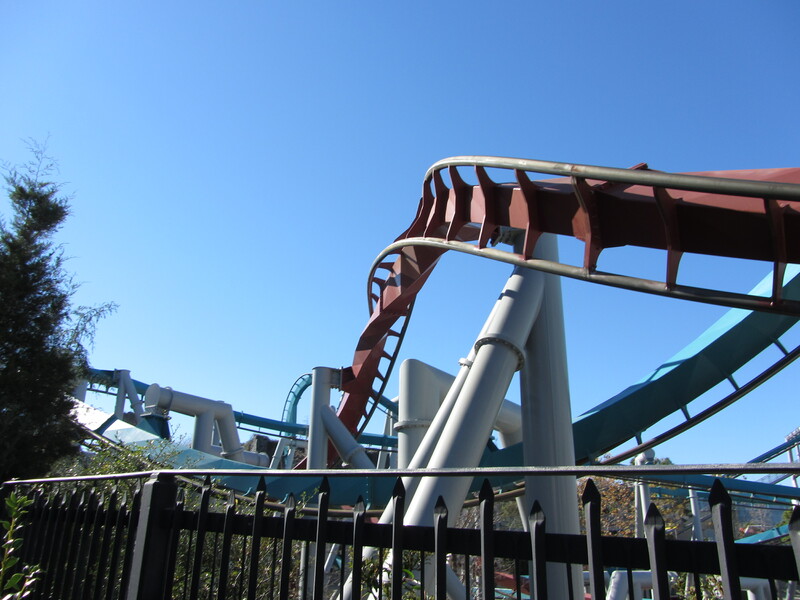 The stylized B&M flying coaster trains in Orlando have a grand manta ray at the front of each train, plus cute smaller mantas at the front of each car, and on the MACK mega coaster trains in San Diego, they have a beautiful, gigantic manta at the front. Personally, I think the original Manta in Orlando better mimics the sensation of being a manta, but due to height restrictions in San Diego they were forced to modify the concept, and in my opinion, they got a less than spectacular result. My vote is to the flying coaster at SeaWorld Orlando. Stand Up Coasters, a lost generation. Stand up coasters, you all know them. Back in the day, they were a top innovation with roller coasters, being able to ride standing up added another element of thrill to a ride. But sadly, now stand-up coasters seem disregarded and neglected. Not the individual coasters, but the overall design. 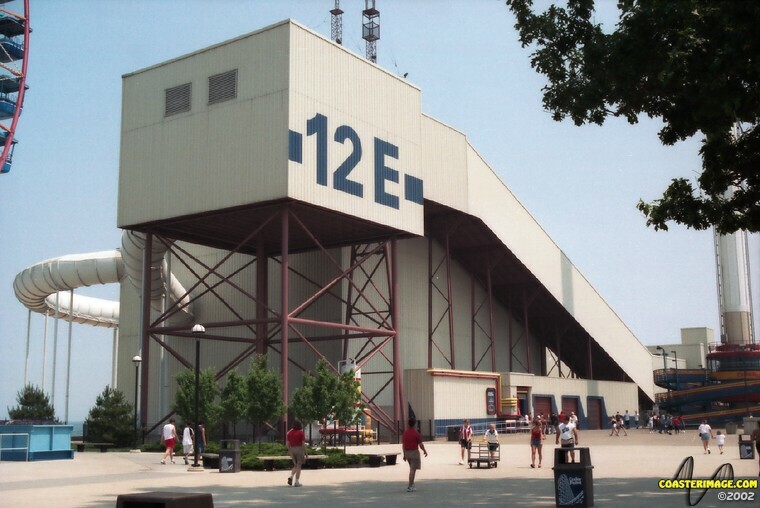 It’s been over a decade since a new stand up coaster opened, and I’m starting to think we might never see a new one again. 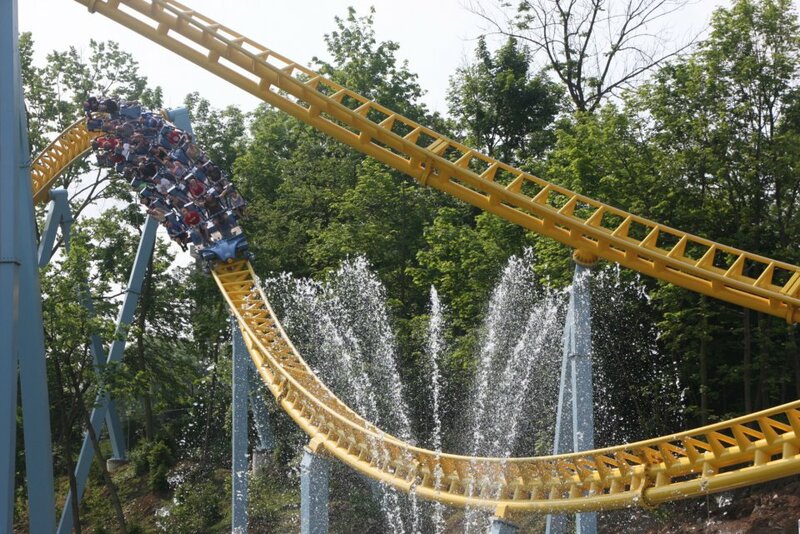 Lets take a look and learn a little bit about this classic class of forgotten coasters. Three coaster manufacturers produced this class of coaster, and between B&M, Intamin, and Togo, 16 of these classic coasters were made, and 13 are still operating. 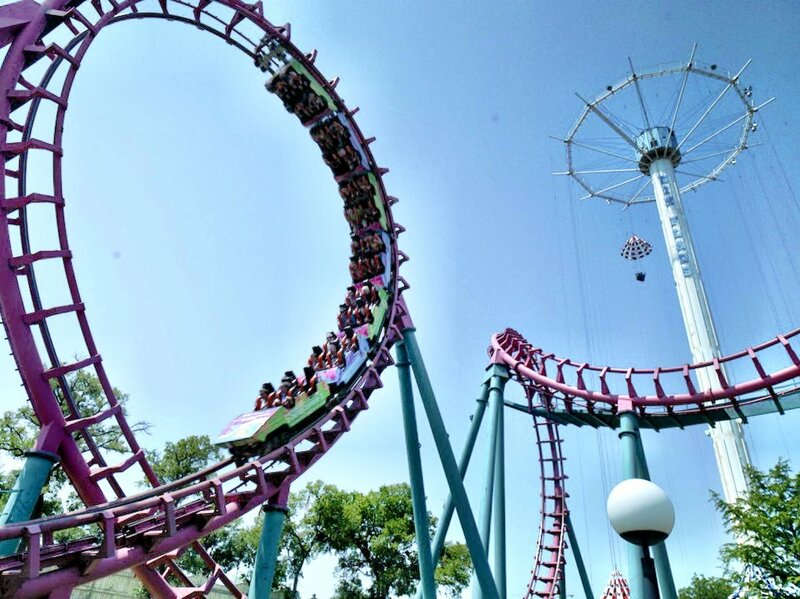 Since each manufacturer made their debut in the market, I’d have to say B&M’s stand ups gained the most traction, and once they had hit their stride, they produced great coasters such as Chang, (now Green Lantern,) and Riddler’s Revenge. 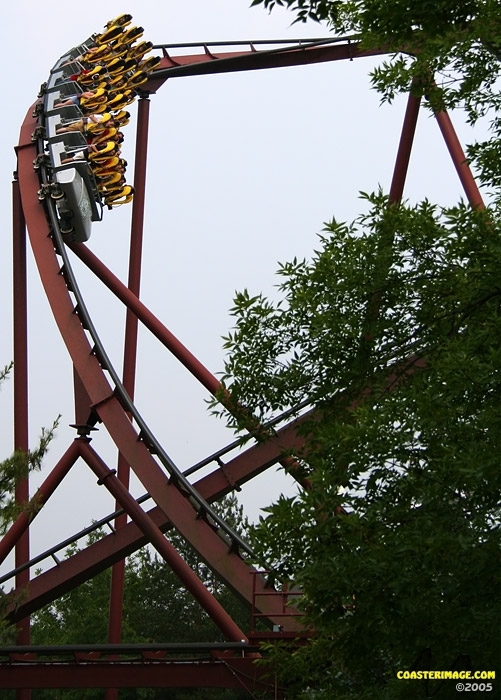 The last stand-up coaster ever built was also a B&M, and that was the 1999 Georgia Scorcher, at Six Flags Over Georgia, in 1999, over 10 years ago! Nobody really knows why these coasters are no longer constructed. Maybe the manufacturers decided to move on, or maybe it was simply because every park that wanted one, already had one. However, despite the lack of new construction, Six Flags, not one to let a coaster go, is recycling their coasters with their re-born ride rotation program. These rides may be down, but they’re not out. Six Flags has relocated Kentucky Kingdom’s Chang to Six Flags Great Adventure where it’s now known as Green Lantern, additionally, this season Six Flags Great America’s classic Iron Wolf will be reborn as Apocalypse at Six Flags America. I’m glad to see these coasters aren’t being sold for scrap, as I find most of the more modern ones to be quite enjoyable! 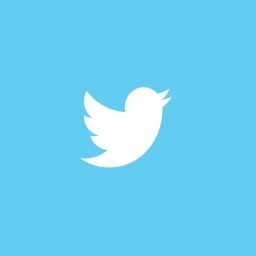 You don’t know what you have, until it’s gone.